"Which Social platforms should I use?" "What do they all do?" 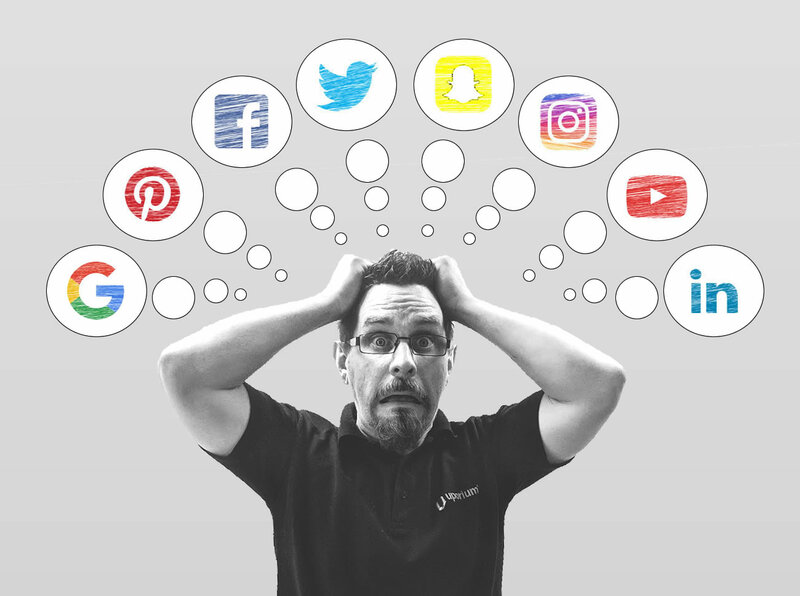 There are so many different choices out there it can be quite overwhelming trying to decide which social media platforms to use in your business. Most businesses have the aim of using social media to increase sales or find new customers, so we've compared all the different social media platforms with a focus on how practical they are in achieving that, how easy they are to use, and which ones are most relevant to different types of businesses. Hopefully by the time you've finished reading this article you'll have a great understanding of which social media platforms are most relevant to your business. Grab yourself a cuppa and let's get to it! Social Media is a series of websites and applications (apps), that enables users to communicate, create and share information, ideas, career interests and other forms of expression via virtual communities and networks. In the vastly virtual world we now live in, over 50% of transactions are now carried out on mobile or tablet devices. Traditional ways of marketing are still relevant to an extent but Social Media and online advertising is where the money is. We do near enough everything on the internet these days, and if a potential customer wants to check out your credibility, where is the first place they will look? On the internet of course. They will probably look for your website first, then if that doesn't satisfy them then they'll look for your social media. Customers will also often turn to social media to see how credible you or your business is. Instagram is a massively popular photo sharing app. This platform allows it's users to take, edit and share photos and videos in a matter of seconds. Founded in 2010 by two university students from the US, it has since acquired 800 million monthly users and was bought by social media giant Facebook in 2012. For a while it was thought that only businesses with physical products should use instagram, after all if you don't have something to take a photo of, it would be pointless using a photo sharing platform, right? WRONG! Nowadays, as long as you have a creative eye you can promote absolutely anything on Instagram. Every business you can think of from Art dealers (super visual) to coaching businesses (with no physical products at all) effectively use Instagram, whether it be generating new business or driving more traffic to their website. It's all about being creative with your imagery and developing a nice looking theme on your Instagram feed. What sort of businesses should use Instagram? For any businesses that sell any kind of products, or anything physical, Instagram is a must! It's great for reaching new customers. Doesn't need to consume lots of your time. Instagram results don't show up in Google. Not as many people use it as use Facebook. You can't post to Instagram automatically from your website, and you can only post to it from a mobile or tablet. If your business does anything visual, or sells any kind of products, then Instagram is a must. We've written quite a lot of articles on how to get the best out of Instagram in our blog, so check them out! Instagram - Business or Personal profile? Pinterest is essentially an online pin board that is used to collect visual media (mostly images), which can be organised into different boards. Such as Home decor ideas, recipes or hairstyles (anything you want really). Uploading images and attach blog posts and shopping pages to them. Like Instagram, Pinterest is very visual and so businesses using it should ensure that the content they are uploading is great quality and eye catching. Unlike Instagram you don't really need to use the captions. But the images and video you use must have the ability to stand out amongst the crowd. What sort of businesses should use Pinterest? Businesses with a visual element to their business. Any business that sells any kind of physical product. Pinterest results often show up in Google; so it can provide multiple ways to reach new customers. Uploading to Pinterest isn't restricted to your mobile or tablet like Instagram is, so you can upload to Pinterest from your computer too, and it's also quite easy to integrate your website with Pinterest to automatically upload content. Has the least amount of active users of any social media channel. Whilst it has the lowest number of active users, Pinterest can be a great tool in reaching new customers. However if you only have the time to use one social media platform and had to choose between Pinterest and Instagram, we'd probably use Instagram. Facebook is a social network that originated as a platform for keeping in touch with friends and family but its wild & rapid success saw businesses, charities, celebrities and more using this social platform to reach out to audiences and potential customers. Following this Facebook introduced features such as pages, Facebook Ads, groups and more. Whether you have physical products or services, Facebook is a great platform for businesses as you can share images, list products or list information about your services. Also if you use a business page, you have features such as customers being able to leave reviews, people calling you directly from your business page, viewing offers and lots more. Having a Facebook page with good reviews on it is a great way to gain new customers as it helps establish trust. Trust is usually the final step in the psychology of the buying process. Research suggests that many people will choose to use a business with a Facebook page with good reviews on it, versus a business without a Facebook page. Facebook is also great for people trying to find local businesses and many people will use Facebook instead of Google to find local businesses. What sort of businesses should use Facebook? More people use Facebook than any other social media platform. There's tons of ways businesses can use it. From setting up a page, to using paid advertising, Facebook has something for pretty much any business. Paid advertising can be expensive for small or start up businesses. Facebook is the social media platform that no business should ignore. If you're not actively using Facebook, we recommend that you do! Possibly the lesser known network of the ones featured in this article, Google Plus is a platform that uses 'Circles' which is a way of categorising and organising the people you're connected with. You can share links, images and other content (very similar to the way you would with Facebook or Twitter) within these Circles and tailor it specifically, to said Circles. Google Plus is not to be confused with the normal Google search engine, or any of Google's other services. What is Google Plus used for? Any business type is compatible with Google plus and according to Business News Daily, it works hand in hand with the Google Search engine. It has the ability to integrate with relevant Google Business services, to draw customers in by providing key business information & potentially rank higher on search results. What sort of businesses should use Google Plus? Hardly anyone actively uses it. If you have the time, then use Google Plus. However if you only have the time for one social media platform, then you'd probably best not wasting your time on Google Plus. YouTube is free a video content sharing platform, which enables you to watch online videos. It was founded back in 2005 by three former PayPal employees and then bought by Google in 2006. What is YouTube used for? YouTube is great for expanding on the information you may already have on display on your website or social media, and it also gives a personal touch with your customers being able to see a face behind the brand. What sort of businesses should use YouTube? Great for reaching new customers. YouTube videos often show up in Google search results as well as YouTube; so there's multiple ways people will find your videos. It can be time consuming to create good videos. If you have videos created already then Youtube is a no brainer. If you don't, then whilst creating videos can be time consuming or costly, they can be a great way of reaching new customers. Snapchat is a mobile messaging application used to share photos, videos, text, and drawings. It's photo and video messages disappear after a set amount of time (that you select). The majority of Snapchat users are those under the age of 35. Snapchat can be a profitable advertising platform for any business, however, do note that about 85% of Snapchat users are under the age of 35 so if your target audience is broader, or over the age of 35, then you might want to use other social media platforms. You'll need a decent sized budget to be able to use the platform for advertising, as it isn't really a platform designed for businesses to use it in the way that the public does. What sort of businesses should use Snapchat? Great if you want to do paid advertising to a younger audience. Not heavily driven towards business use. Snapchat isn't particularly geared towards business use, and the main users (85%) are under the age of 35. However if your target audience is a younger audience, and you have a decent advertising budget, then Snapchat can prove very successful as it has done for businesses such as Starbucks. Twitter is essentially a micro blogging platform, where you share short, sharp bursts of content or information with people, called 'Tweets'. Founded in 2006 Twitter was infamous for its 140 character tweet limit until the latter part of 2017, when they increased it making it 280. Any business can use Twitter effectively, so long as you create interesting, relevant and engaging content to tweet. Just take Wendy's for example, they are an American fast food chain and gained more than 300,000 followers on Twitter by 'Roasting' their customers and competitors. I wouldn't recommend this as a way of gaining brand visibility, but hey it works for them! What sort of businesses should use Twitter? The short character limit means you can engage with Twitter without a huge amount of effort. It has one of the smallest amount of users. It also has a declining user base. Less and less people are using Twitter. Unlike Facebook, we'd no longer regard Twitter as something "essential" for a business to use. LinkedIn is essentially a professional version of Facebook. Whilst most people use Facebook to connect with their friends socially, LinkedIn is used to connect with colleagues, clients, suppliers and employers on a professional level. We often think of LinkedIn as quite "stuffy". Think of it more like a "networking" platform rather than a "social" platform. We're not the kind of people to wear suits to work, and LinkedIn feels like quite a "suited and booted" social media platform. What sort of businesses should use LinkedIn? If your customers are the kinds of people to use LinkedIn, it can be an ideal way of getting in touch with them. Not very "social" and more geared towards networking. Lots of smaller businesses don't use LinkedIn. LinkedIn is most useful if you're trying to recruit staff or you are a B2B (business to business) company and the kind of businesses you want to connect with use LinkedIn. It's about quality; not quantity! If you only have the time for one or two social media platforms, then just stick with these and don't bother with any others. You'll get much better results if you do a great job engaging with one social media platform rather than trying to use all of them. There's nothing worse than visiting somebody's social media page to find that the last time they posted was 2 years ago! So if you have any social media accounts which are no longer active, disable them until such time you can revisit using them. There's no such thing as the "best" social media platform to use. You need to pick the platforms that are most relevant to your business. If you sell any kind of product, or do anything visual, then platforms like Instagram and Facebook are going to be most relevant to you. If you're a service based business, then perhaps Facebook and YouTube might be more relevant. Either way, have a good read through everything in the above article and pick what's most relevant to your business. Want to know more about how to use Social Media? We will soon be launching Social Media courses in mid to late 2018. To register your interest or find out more contact us.